Is there such a thing as Rich Food Rice? In Rich Food Poor Food, we included rice in our “better grain if you’re going to eat grain” category, but we want to say a little more on this topic because choosing the right rice is a bit paradoxical. What do we mean? Well, we all have heard that brown rice or wild rice is more micronutrient packed than refined white rice—and therefore theoretically better to eat. However, brown rice and wild rice also contain phytic acid—a potent Everyday Micronutrient Depleter (EMD). So, what to do? We really only have two options. We can soak/ferment brown or wild rice with a somewhat laborious but highly effective process (detailed shortly), or we can eat refined white rice. If we have planned ahead at least a day, we can exercise the first option. But here is the paradox: if you are out at a restaurant or dining at a friend’s house and there is a choice between brown/wild rice (not soaked/fermented) and white rice, you would be better off eating the refined white rice because of its lack of phytic acid. Make no mistake, the white rice will not contribute to your micronutrient sufficiency, but it will not deplete it to any great extent, either. So, except for the blood sugar spike, and the potential allergic reactions some people can get from rice (especially those with wheat sensitivities), the white rice is a benign meal filler. Well, benign unless you are carrying unwanted body fat. In which case, our tendency to fill meals with grain-based carbohydrate foods can be the difference between effortlessly maintaining our ideal body composition over decades or falling into the statistical average that an American gains 1.5 pounds of fat each year from age twenty-five to fifty-five (and loses a half-pound of muscle each year). When you center your diet around sense of satiety from your meals and Rich Foods with ￼￼￼￼high micronutrient values, you will gain a greater sense of satiety from your meals and snacks ￼and naturally regulate your caloric intake ￼without the usual struggling and suffering. By all means, make the best choices s with your rice, pasta, or bread products, but remember that opting out is also a choice! Regardless of the shade of rice you choose, purchasing only organic rice will save you from the thirteen known pesticides commonly found in conventional rice. Remember, recent reports also show rice to have high levels of arsenic. Thoroughly rinsing and cooking your rice with six cups of water to one cup of rice and then draining the excess water is one way to reduce this harmful carcinogen. While this will lead to more micronutrient loss than conventional methods of cooking, it can reduce inorganic arsenic content by about 30 percent. Looking for a way to prepare whole brown rice that increases its mineral availability? Well, look no further. Neurobiologist Dr. Stephan Guyenet discovered an effective way to ferment rice and beans and reduce phytic acid by up to 96 percent! Based on a scientific paper out of Beijing that studied the effects of soaking, sprouting, and fermentation on phytic acid in brown rice, Dr. Guyenet noted that researchers found it was the fermentation process and not the soaking that effectively degraded phytic acid—even better than sprouting. 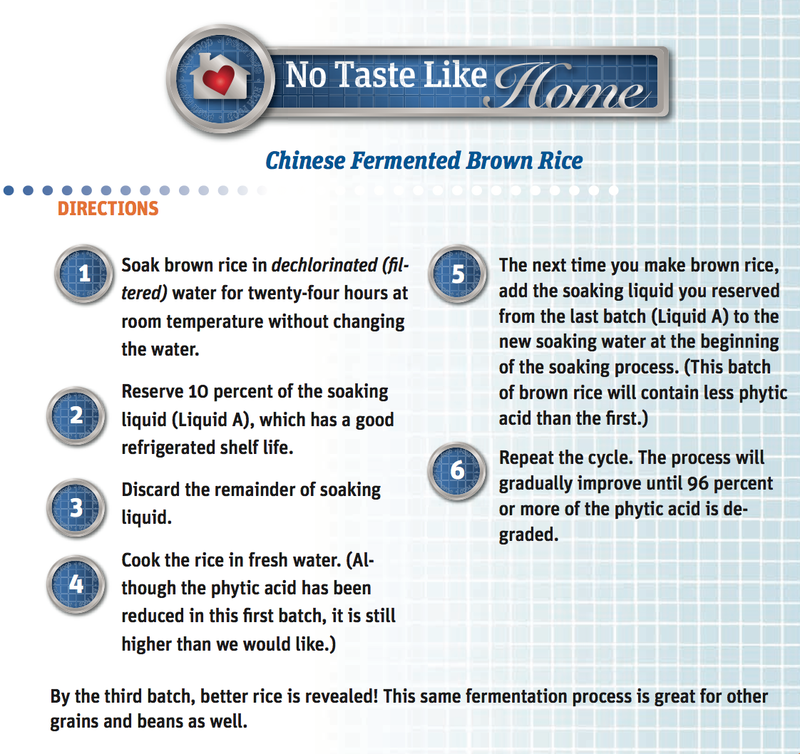 Here is a traditional Chinese procedure for fermenting brown rice.